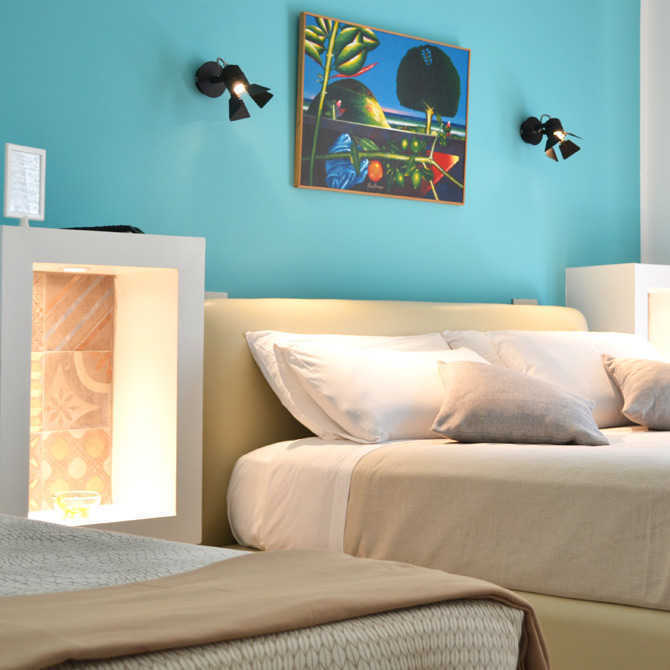 B&B Ai Viceré is Central to the area of greatest historical and artistic interest in Palermo. We have tried to mix the passion for contemporary art with a taste for hospitality, in fact our guests can enjoy the vision of paintings and sculptures made by the most important artists of the twentieth and twenty-first century, Sicilians and not creating a particular union between the ancient taste of the dwelling and the contemporary. Located inan historic building of the early ‘900 is characterized by spacious rooms, high ceilings and finally a pleasant antique flooring.The B&B offers differents types of rooms and Appartment :Standard hospitality (having a private bathroom outside the room), Superior (with en suite bathroom), Family with external bathroom and Family superior with private bathroom. In fact, they distinguish between them because of the peculiarity and the choice of warm and intense colors of the details that are associated with modern furnishing, giving a combination of hospitality and guaranteed comfort. Services always included; TV, air conditioning, heating, hair dryer, mini bar, bath towels, bed linen, free WIFI, Breakfast, daily room tidying, iron. Comfortable and bright rooms, have an elegant and contemporary decor with attention to detail. The rooms are equipped with every comfort, and all with private external bathroom with tub or shower. 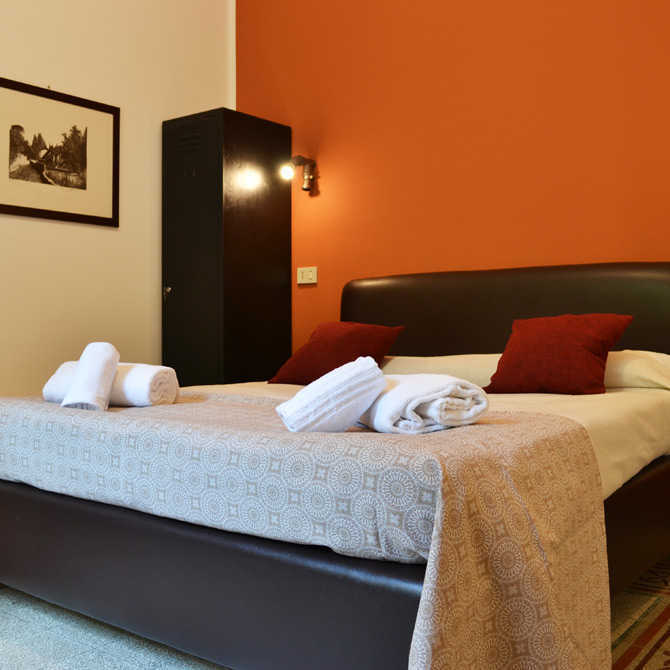 Bathroom located externally, a few steps from the room, private and exclusive use of the room, with the possibility of a shower or bath.Double or twin room with the possibility of a balcony overlooking the Teatro Massimo or an internal garden terrace. It is possible to add a bed for a third guest. Size 20 square meters, flat screen TV, WIFI Free 24h, luggage stand, air conditioning, heating, towels and bath towels, bathrobe (on request free), hair dryer, bed linen. Superior Rooms Large and comfortable double rooms with modern furnishings and finishes create an enveloping atmosphere for your holiday. All have an ensuite bathroom with a shower. Neutral colors, furnishings with modern and minimal lines emphasize the spaciousness and comfort of this room, complete with every comfort and service, bathroom located inside the room with shower. Double or twin room. The room overlooks an internal courtyard or an external balcony. The room allows you to add an extra bed and become a comfortable triple. Size 20 square meters, flat screen TV, WIFI Free 24h, luggage stand, air conditioning, heating, desk, bath and shower towels, bathrobe (on request free), hair dryer, kitchen use, bike rental. 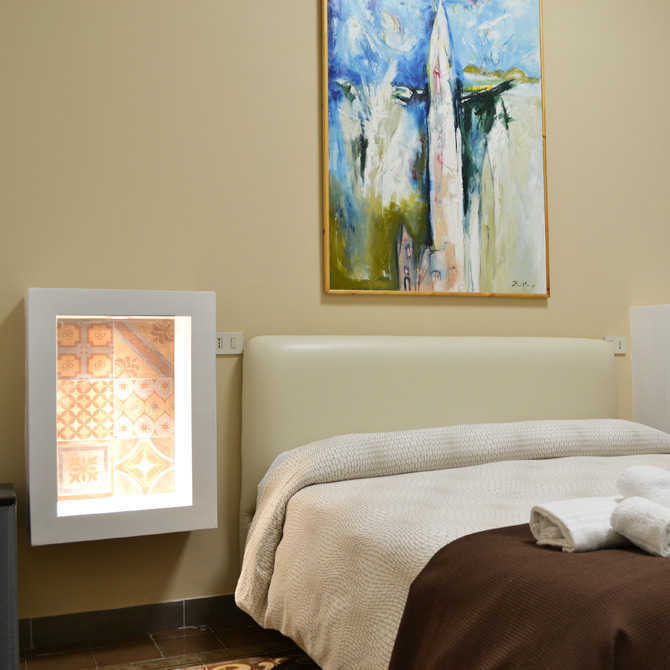 Type of room with a large square, suitable for families or group , ideal for spending the holidays in Palermo in total relaxation. Equipped with all basic services and welcoming atmospheres. Quadruple room with double bed and two single beds, or with four single beds. The room overlooks an internal courtyard or an external balcony. Private bathroom located in front of the room with a shower. Wide square suitable for families with children or small groups of friends, equipped with all the comforts is the most loved by families and especially by those who do not want to give up the pleasure of comfort. Bathroom located inside the room with shower. Size 25 square meters, flat screen TV, WIFI Free 24h, luggage stand, air conditioning, heating, desk, bath and shower towels, bathrobe (on request free), hair dryer, kitchen use, bike rental (if available).